Manage your public infrastructure and streamline data capture for inspections and maintenance. 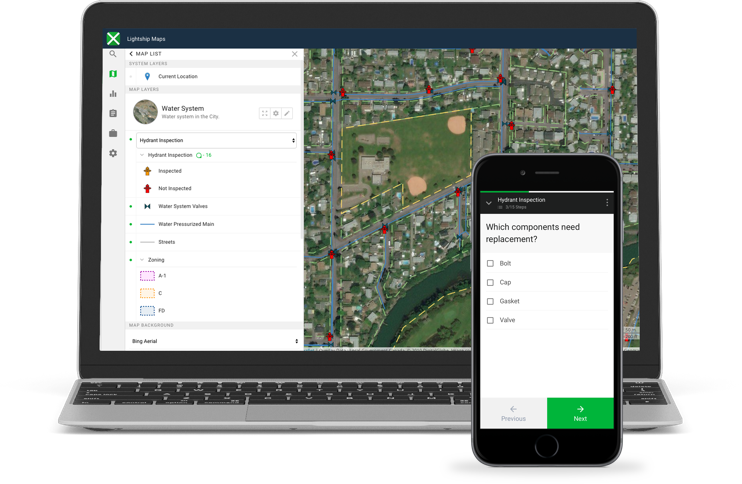 Jump-start your asset management with municipal mapping tools that work seamlessly on desktop & mobile. Most asset management systems are complex and time consuming to set up and maintain. Lightship is simple to implement and use, providing ROI within days of initial sign-up. Visualize all of your GIS data, then build custom forms to capture inspections and maintenance data in the field. Instantly generate summaries to inform planning and budget processes. View the location and condition of your public infrastructure, then identify priorities for maintenance and replacement. Lightship offers multiple zones for data storage, meeting data residency requirements for local governments. Lightship makes it easy to share municipality maps, reports, and forms with staff, contractors, members of the public, and other agencies. Lightship helps you understand where your crews are, what they are working on, and ensures that safety check-ins or requests for assistance are quickly and easily managed. Digitize data capture, enhance safety procedures, and facilitate communication with your field staff. Lightship’s simple, shareable forms increase data quality, and eliminate time spent on data entry. Multiple records can be tracked for inspection and maintenance on each asset, then viewed as a trend graph. Assign work, dispatch crews, monitor progress, and automate check-ins. When unexpected events occur, find the people you need quickly and easily with skill and location-based search. Monitor, view sensors & SCADA. Lightship's advanced IoT capability is perfect for monitoring the status of sensors or SCADA systems in your community. View current readings directly on the map or set up custom alerts and alarms to notify you of potential problems. Instantly view current readings, historical values, and trend graphs. Use the map to visualize the relationship between monitoring equipment and physical infrastructure. Improve the way you respond to critical events by setting multiple custom alerts and alarms. For each event, define routines for notification and response, including escalation steps if the event is not resolved.